The English word karst was borrowed from German Karst in the late 19th century, which entered German much earlier. According to one interpretation the term is derived from the German name for a number of geological, geomorphological, and hydrological features found within the range of the Dinaric Alps, stretching from the northeastern corner of Italy above the city of Trieste (at the time part of the Austrian Littoral), across the Balkan peninsula along the coast of the eastern Adriatic to Kosovo and North Macedonia, where the massif of the Šar Mountains begins, and more specifically the karst zone at the northwestern-most section, described in early topographical research as a plateau, between Italy and Slovenia. In the local South Slavic languages, all variations of the word are derived from a Romanized Illyrian base (yielding Latin: carsus, Dalmatian Romance carsus), later metathesized from the reconstructed form *korsъ into forms such as Bosnian: krš, kras, Croatian: krš, kraš, Serbian: kras, and Slovene: kras. Languages preserving the older, non-metathesized form include Italian: Carso, German: Karst, and Albanian: karsti; the lack of metathesis precludes borrowing from any of the South Slavic languages, specifically Slovene. The Slovene common noun kras was first attested in the 18th century, and the adjective form kraški in the 16th century. As a proper noun, the Slovene form Grast was first attested in 1177. Ultimately, the word is of Mediterranean origin. It has been suggested that the word may derive from the Proto-Indo-European root karra- 'rock'. The name may also be connected to the oronym Kar(u)sádios oros cited by Ptolemy, and perhaps also to Latin Carusardius. Johann Weikhard von Valvasor, a pioneer of the study of karst in Slovenia and a fellow of the Royal Society for Improving Natural Knowledge, London, introduced the word karst to European scholars in 1689, describing the phenomenon of underground flows of rivers in his account of Lake Cerknica. Jovan Cvijić greatly advanced the knowledge of karst regions, so much that he became known as the "father of karst geomorphology". Primarily discussing the karstic regions of the Balkans, Cvijić's 1893 publication Das Karstphänomen describes landforms such as karren, dolines and poljes. In a 1918 publication, Cvijić proposed a cyclical model for karstic landscape development. 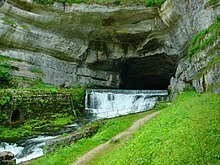 Karst hydrology emerged as a discipline in the late 1950s and early 1960s in France. Previously, the activities of cave explorers, called speleologists, had been dismissed as more of a sport than a science, meaning that underground karstic caves and their associated watercourses were, from a scientific perspective, understudied. The development of karst occurs whenever acidic water starts to break down the surface of bedrock near its cracks, or bedding planes. As the bedrock (typically limestone or dolostone) continues to degrade, its cracks tend to get bigger. As time goes on, these fractures will become wider, and eventually a drainage system of some sort may start to form underneath. If this underground drainage system does form, it will speed up the development of karst formations there because more water will be able to flow through the region, giving it more erosive power. This reaction chain forms gypsum. The karst topography also poses difficulties for human inhabitants. Sinkholes can develop gradually as surface openings enlarge, but progressive erosion is frequently unseen until the roof of an underground cavern suddenly collapses. Such events have swallowed homes, cattle, cars, and farm machinery. In the United States, sudden collapse of such a cavern-sinkhole swallowed part of the collection of the National Corvette Museum in Bowling Green, Kentucky in 2014. Interstratal karst is a karstic landscape which is developed beneath a cover of insoluble rocks. Typically this will involve a cover of sandstone overlying limestone strata undergoing solution. In the United Kingdom extensive doline fields developed at Mynydd Llangynidr across a plateau of Twrch Sandstone overlying concealed Carboniferous Limestone. Kegelkarst is a type of tropical karst terrain with numerous cone-like hills, formed by cockpits, mogotes, and poljes and without strong fluvial erosion processes. This terrain is found in Cuba, Jamaica, Indonesia, Malaysia, the Philippines, Puerto Rico, southern China, Myanmar, Thailand, Laos and Vietnam. The world's largest limestone karst is Australia's Nullarbor Plain. 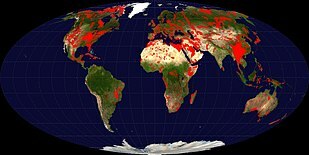 Slovenia has the world's highest risk of sinkholes, while the western Highland Rim in the eastern United States is at the second-highest risk of karst sinkholes. Mexico hosts important karstic regions in the Yucatán peninsula and Chiapas. ^ a b c Ford, Derek (2007). "Jovan Cvijić and the founding of karst geomorphology". Environmental Geology. 51: 675–684. doi:10.1007/s00254-006-0379-x.